The Museo del Prado is opening the newly restored and enlarged Casón del Buen Retiro prior to its inauguration as the Prado’s new Study Centre. A series of Open Doors Days will take place between 21 February and 4 May from Wednesdays to Sundays, 12pm to 8pm, free entry. 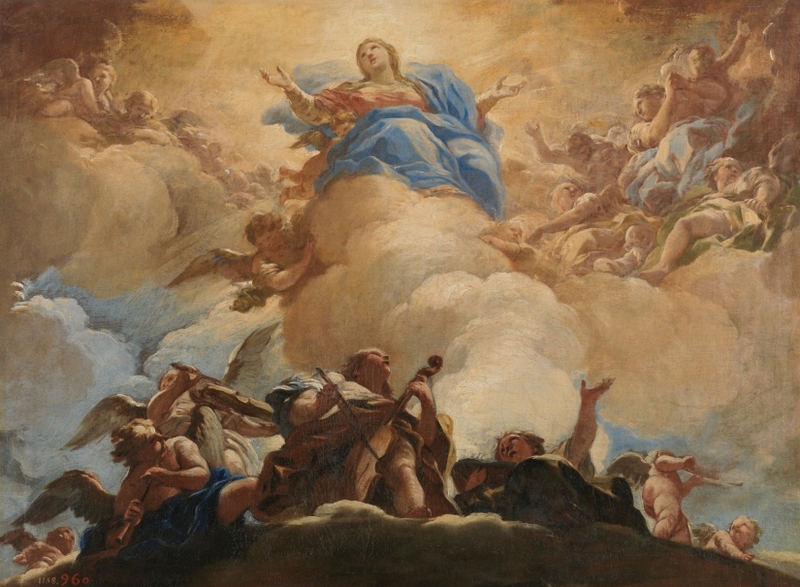 During this period the Casón will be showing a monographic exhibition devoted to Luca Giordano that focuses on The Apotheosis of the Spanish Monarchy, the most important and impressive fresco that the artist painted in Spain. 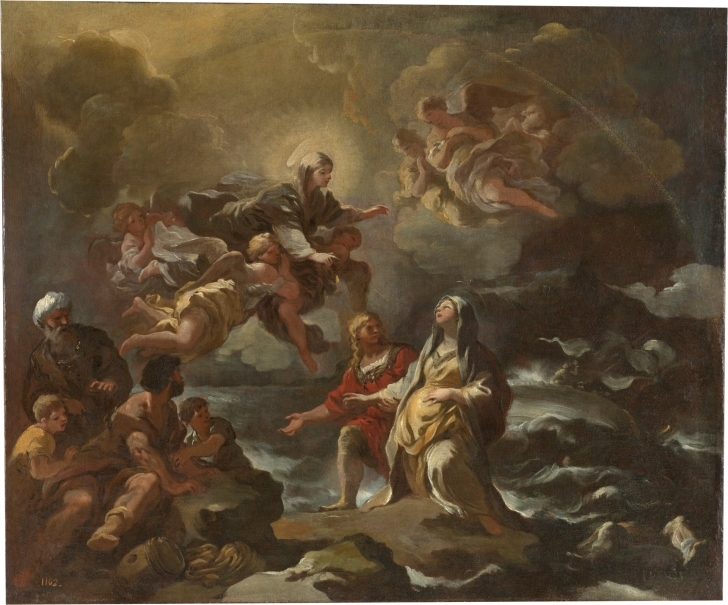 The exhibition will feature a group of 75 works including drawings, architectural plans, watercolours, oil paintings and prints with the intention of explaining Giordano’s painting in the Casón, its history, meaning, iconography, technique and the various restorations that it has undergone in the past. In addition, the fresco – considered the most perfect of all the works that Giordano painted in Spain – will be used to analyse all of Giordano’s Spanish mural schemes, namely the staircase and ceilings in the Basilica of San Lorenzo de El Escorial (1692-1694), the office and bedroom (the latter now lost) of Charles II in the Palace of Aranjuez; the Casón del Buen Retiro (ca.1697); the Sacristy in Toledo Cathedral (1698); the Royal Chapel in the Alcázar (now lost); and the church of San Antonio de los Portugueses, Madrid (1699). 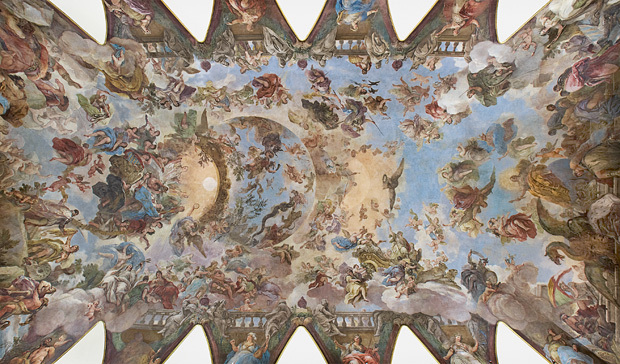 The use of the Casón as the venue to present the present exhibition (which includes 56 paintings by Giordano) marks the last chapter of a lengthy process of research initiated in 2001 when the restoration of the ceiling was started. This project has been led by Andrés Úbeda de los Cobos, Head of the Department of Italian and French Painting up to 1700 at the Prado. It has primarily focused on two key aspects: firstly, the history of the ceiling and its meaning and secondly, Giordano’s use of fresco and the distinctive characteristics of his approach to the medium, allowing us to see him as an artist permanently committed to experimenting with new supports and materials and the application of innovative solutions in response to the specific nature of Spanish architecture. 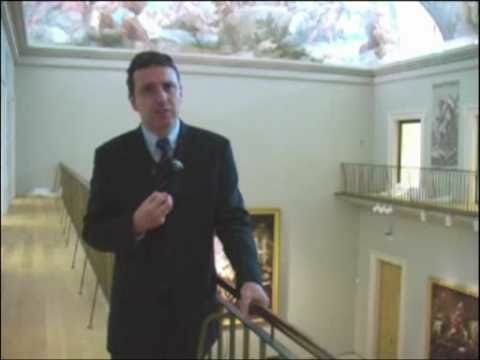 The exhibition thus offers a unique opportunity to appreciate the importance of Giordano’s most outstanding fresco executed in Spain as well as to learn more about his mural painting in general. With this in mind, the Museum has also organised an international conference on Giordano’s mural painting, which will set out the bases for our knowledge of this fascinating aspect of his output. It is anticipated that the conference will count on the participation of leading experts in this subject. Together with the Church of the Jerónimos and the Army Museum, the Casón is one of the last three surviving elements of the Buen Retiro Palace, built by Philip IV in the 1630s. At that date the Casón consisted of a central hall and two vestibules which connected to the palace and its gardens. Its appearance was radically altered in the 1880s when it acquired its present form. At that point the building lost the vestibules at either end, also decorated by Giordano, and additions were made around the central hall. 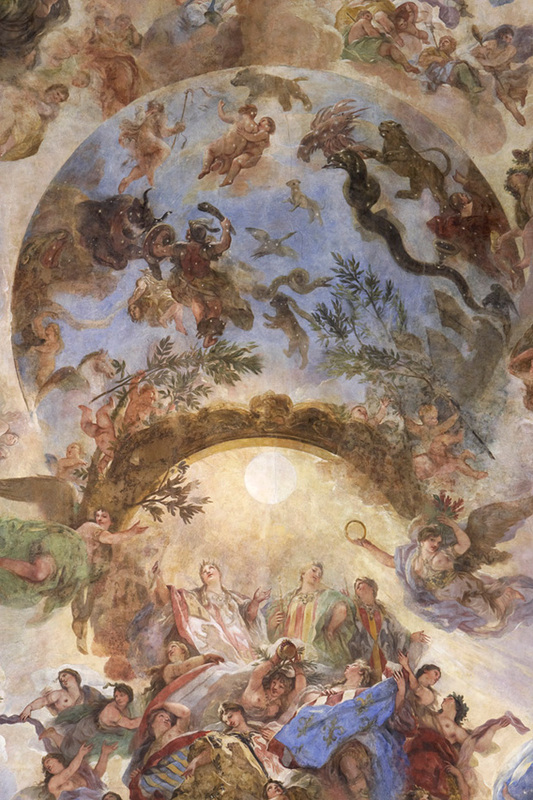 The ceiling fresco in the hall, or Salón depicts The Apotheosis of the Spanish Monarchy, which can now be seen in its restored state and free of the overpainting that has obscured its quality. On the walls, between the windows, were scenes from the life of Hercules, also lost in the 19th century, but whose appearance is known from copies painted by José del Castillo and from the prints after them. Eight of these scenes have been reproduced in the Salón in order to convey the original look of the room’s decoration. Sadly, we only have knowledge of the appearance of the west vestibule, which connected to the palace and in which Giordano painted various frescoes and oil paintings on scenes from the life of Fernando el Católico in the War of Granada (1492). Three of the paintings from that space have survived and are now exhibited in the Salón. 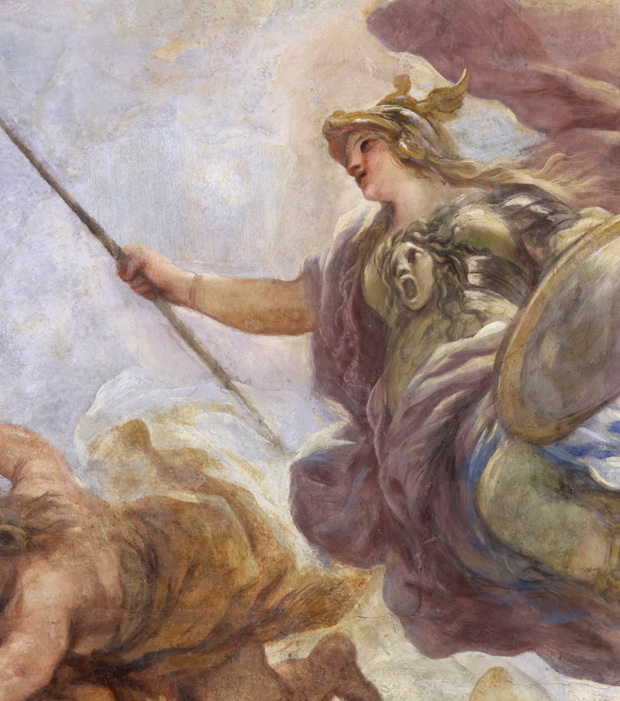 In addition, Giordano also painted the four Cardinal Virtues in fresco (Justice, Prudence, Fortitude and Temperance) and the four parts of the globe. These elements have disappeared, although we know how they looked from 18th-century prints. Luca Giordano was born in Naples in 1634. Son of a modestly talented artist, he seems to have received his first training in the studio of José de Ribera, remaining there for eight years according to his biographers. There is evidence of an early trip to Rome around 1652 where the artist was particularly attracted to the art of Antiquity, the Renaissance and the work of Pietro da Cortona. On his return to Naples, Giordano developed a distinctive style influenced by Mattia Preti and Rubens. Another important trip for his artistic education was the one to Florence and Venice in 1665, and the art of Veronese in the latter city particularly influenced him. At the end of the 1770s, Giordano became a fully established painter of large mural schemes, of which the most important is the gallery of the Medici-Ricardi Palace in Florence (1685). Giordano’s work soon began to arrive in Spain, including The Massacre of the Innocents, which was already in El Escorial in 1667. Giordano’s career was in fact associated from an early date with Spaniards living in Naples, while he later undertook commissions for the Spanish monarch. Messina returned to Spain constitute the earliest evidence of the artist’s lifelong association with Spain. This room displays small-format works executed in a loose technique. Paintings of this type are normally termed “preliminary sketches” although they may not all have functioned in this way. Three of them (from a set of four) relate to the frieze on the staircase of the monastery of San Lorenzo de El Escorial, which was built to commemorate the victory of the Spanish army over the French at the Battle of Saint Quentin on 10 August 1557, Saint Lawrence’s day. These sketches are among Giordano’s first Spanish works and he executed them to the best of his abilities, knowing that they would have to be approved by his new patron, the Spanish king. In addition, this room also includes two equestrian portraits of Charles II and Mariana of Neuburg, the king’s second wife. 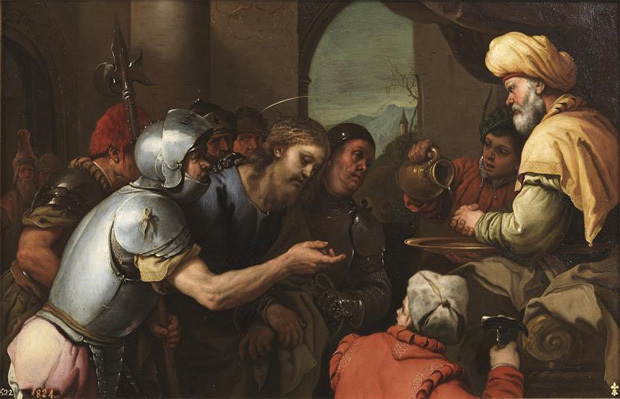 They are painted in a delicate, almost miniaturist technique, suggesting that they may not be preliminary sketches. Also on display are two religious scenes (Saint Bridget saved from a Shipwreck by the Virgin and The Assumption of the Virgin), whose original purpose is unknown. Pilate washing his Hands. 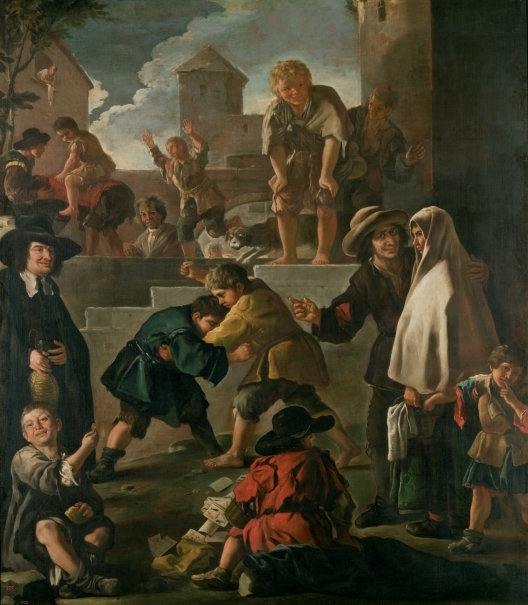 Luca Giordano. 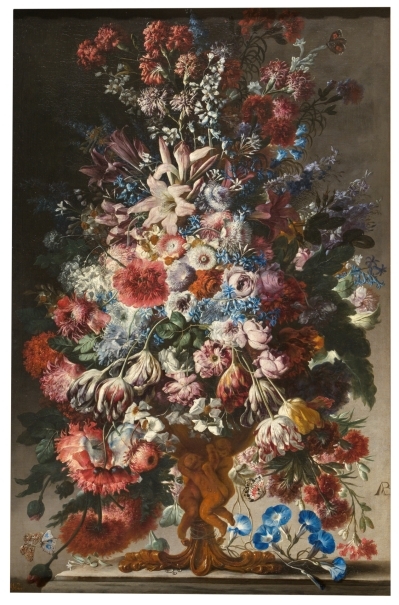 1655 - 1660. Oil on copperplate. Giordano revealed a surprising ability to imitate others artists throughout his career. Not only did he copy their style but also used old supports and developed sophisticated techniques for artificially ageing the appearance of these works. On occasions he also faked the signature of the artist in question, as can be seen here in the two Holy Families in the style of Raphael which bear Raphael’s monogram. On a very few occasions Giordano even concealed his own signature in the work in order to be able to prove his authorship if necessary. This practice of imitating the work of others is now the most disconcerting aspect of Giordano’s art. There is no doubt that he used his skills to increase his prestige, proving himself capable of deceiving the finest connoisseurs living in Naples, as well as Charles II himself, shortly after the artist’s arrival in Madrid. His clients, who in his early years felt deceived by this practice, would eventually, during the Spanish period, commission works “alla manera di”, which were by that date considered evidence of Giordano’s skills. Giordano lived in Spain from 1692 to 1702, working for Charles II on the production of various mural projects and numerous oil paintings. 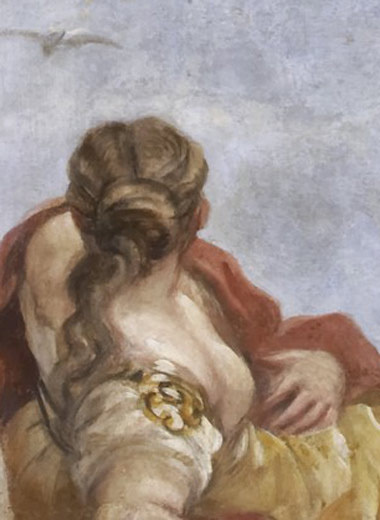 His style evolved in Spain and he developed a lighter palette and a looser, richer brushstroke in a manner that anticipated 18th-century painting. He returned to Naples as a consequence of the War of Spanish Succession, which brought Philip V to the Spanish throne, although in fact, Philip held Giordano in high esteem. In Naples he continued to work for the Spanish monarch on projects such as the paintings that were to complete the decoration of the royal chapel in the Alcázar, a commission of 1703 that remained unfinished at his death which took place on 3 January 1705. Many Spanish painters were fascinated by his art, most notably Miguel Jacinto Meléndez (1679-1734) and Antonio Acisclo Palomino (1655-1726), the latter a regular associate of Giordano. The most important of the artists to be captivated by Giordano’s art was, however, Francisco de Goya (1746-1828), who had been interested by him since his earliest youth. Goya’s tapestry cartoons of the 1770s and 1780s reveal a clear interest in emulating Giordano’s work, particularly in details such as the physical types of the children. However, this influence is most noticeable in Goya’s frescoes. Luca Giordano, known in Spain as Lucas Jordán, painted the ceiling of the Casón around 1696-97. The artist had been summoned by Charles II in 1692 to decorate the staircase and ceilings of the Basilica of El Escorial (1692-1694). He then moved on to the decoration of the king’s office and bedroom (the latter now lost) in the Palace of Aranjuez; the Casón del Buen Retiro (ca.1697); the Sacristy of Toledo Cathedral (1698); the Royal Chapel of the Alcázar (now lost); and San Antonio de los Portugueses, Madrid (1699). The ascent to the throne of Philip V in 1701 and the start of the War of Spanish Succession prompted Giordano’s return to Naples in 1702. He died there in 1705, leaving behind a very extensive oeuvre and a considerable fortune. The subject represented on the ceiling of the Casón is The Apotheosis of the Spanish Monarchy, painted during the reign of Charles II, the last monarch of the Habsburg dynasty. The composition features various scenes that glorify the historic grandeur of Spain, its extensive dominions, its triumph over heresy and the founding of the Order of the Golden Fleece. 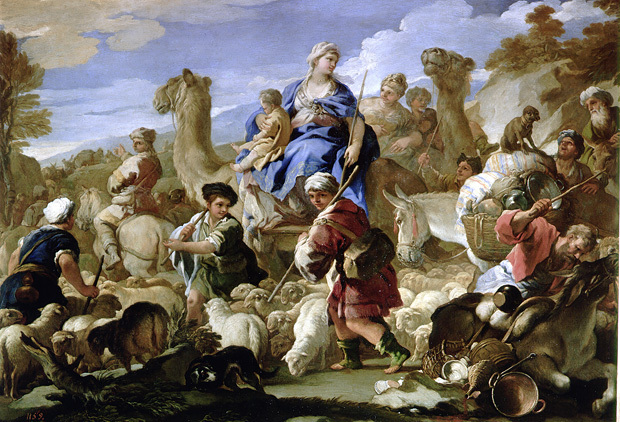 Luca Giordano is among the Italian Baroque artists most positively treated by recent art criticism. As a result, his reputation has now recovered from the effects of the two prejudices that have traditionally been associated with his artistic reputation. The first was that of his rapidity of execution, which was later interpreted as superficiality. The second was his startling ability to imitate the style of other artists, which at times relegated him to the status of a copyist. The revival of Giordano’s critical fortunes dates from the monograph by Oreste Ferrari and Giuseppe Scavizzi (first edition 1966), which included a rigorous catalogue of the artist’s work and a biography elaborated on the basis of historical data. The most obvious manifestation of his critical rehabilitation was the exhibition held in Naples in 2001, which later travelled to Vienna and Los Angeles. Luca Giordano merits a Spanish version of the 2002 exhibition, particularly given that he spent ten years in Spain from 1692 to 1702. Giordano’s Spanish period was affected by various prejudices that functioned to conceal historical reality. Most significantly, his artistic merits were dismissed and he was seen as a painter who steered young Spanish artists along a misguided path resulting in superficially dramatic paintings alien to the national tradition. It also proved easy to denigrate the figure of Giordano, associating him with the defects of the monarch. Charles II, “El Hechizado”, was a feeble, infantile and capricious character who showed a complete lack of interest in painting throughout his life. The political, military and economic decline that characterised his reign was thus seen to find its parallel in the field of painting. The pair formed by the monarch and Luca Giordano was consequently presented as the complete opposite of the one formed by Philip IV and Velázquez in the previous reign, given that Philip was a monarch appreciative of the art of painting who found in Velázquez an artist capable of creating his royal image. Luca Giordano (Naples 1634-1705) is one of the most influential of all Spanish and Italian Baroque painters. Celebrated since childhood for his talents and speed of execution, Giordano was particularly gifted at fresco painting, a medium in which he developed a distinctive style that looks forward to 18th-century painting. In addition, Giordano was remarkably skilled at imitating the works of other artists, a fact that resulted in accusations of forgery. Giordano lived in Spain between 1692 and 1702, where he was the most important painter of the last period of Charles II’s reign. In Spain he executed major commissions including seven mural schemes of which five have survived, although the one in the Casón has unfortunately been mutilated. Giordano first worked at El Escorial (1692-94) before moving on to Aranjuez where he decorated Charles II’s bureau (ca.1695-96), a scheme which has only recently been rediscovered. The artist then decorated the Casón del Buen Retiro, of which only the central hall or Hall of the Ambassadors has survived (ca.1696-97). Next, Giordano painted the vault of the Sacristy in Toledo Cathedral (1698) and on his return to Madrid painted the royal chapel in the Alcázar (ca. 1699, destroyed), the church of San Antonio de los Portugueses (or Alemanes, 1698-1700), and the church of Nuestra Señora de Atocha (after 1700, destroyed). In addition to all the above, Giordano painted a vast number of paintings on canvas and formulated the image of Charles II in the last years of the monarch’s life. The Casón closed in 1997 for restoration and remodelling involving the construction of two basement floors and the restoration of the Hall of the Ambassadors, which is decorated in fresco by Luca Giordano. The room’s ceiling is the last surviving element of the mural decoration executed by him. It was restored between 2001 and 2006.